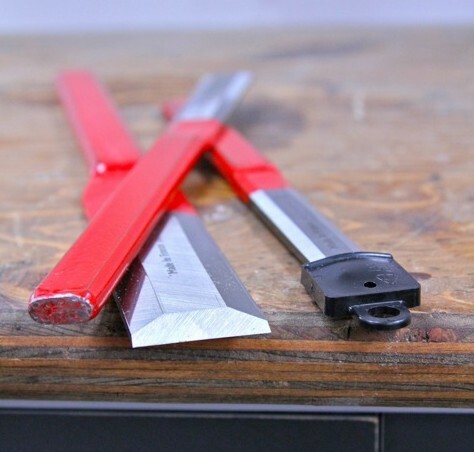 woodworking equivalent of solving simple math problems, and silky-smooth results are guaranteed to happen if you do everything right. are ideal for various stages. Belt sander, half-sheet sander, quarter-sheet sander. 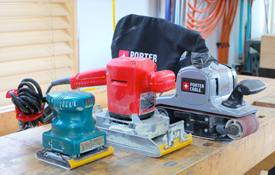 These are the three power tools I use most often while creating fine urethane finishes on interior wood surfaces. If your project involves solid wood panels glued together on edge, for instance, then you’ll probably want to start with a belt sander spinning an 80- or 100-grit abrasive to level all glue joints. If you’re dealing with smoothly planed, unlaminated pine, then a half-sheet sander with a 120-grit abrasive is a good start. 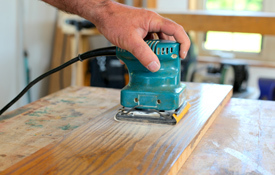 A 150-grit abrasive is often ideal for beginning on hardwood veneered plywood. erased all marks left by the previous grit. attachment so the wood doesn’t get marked up. synthetic brush with as smooth strokes as possible. something you can be proud of. 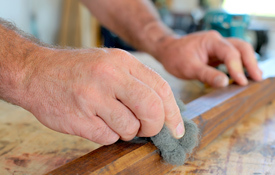 between coats, wrap it around a piece of foam insulation, then gently rub all flat surfaces parallel to the grain to knock off the tiny bumps left when dust particles landed on the surface while the urethane was wet. Next, grab your random orbit sander, peel off the abrasive disk, then place it on top of a fine 3M rubbing pad on the surface. Switch the tool on and let the machine oscillate the pad on the finished wood, refining the finish. The results will be perfectly smooth in a few minutes, with a lovely satin sheen. Continue with a super fine 3M pad for high-gloss results that look like glass. VIDEO TOUR: Is a Tankless Water Heater for You? How should I insulate my basement?